Now dos Anjos is heading into UFC 225’s interim welterweight title clash against a man many believe to be a carbon copy of the Irishman. The former lightweight champion is not buying Covington’s ‘act’, however. “Yeah, because I’m a professional fighter,” Covington replied. Rafael dos Anjos is can land a second title in two weight classes with a win over UFC 225 following his impressive 3-0 record at welterweight with wins over Robbie Lawler, Neil Magny, and Tarec Saffiedine. Covington is 5-0 at 170, but it is his trash talking which seems to have elevated him to this position. The Brazilian believes that Covington’s behavior is far from genuine. 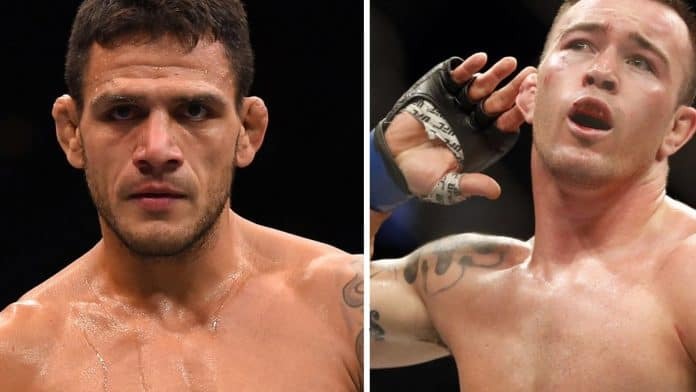 For dos Anjos, his American counterpart is nothing more than two different people, depending on the environment and whether the cameras are on or off. Claiming that Covington is a quiet man of MMA when there are ‘people around,’ the 33-year-old is unimpressed with the image that “Chaos” is trying to project. The winner of this fight will likley earn a shot at Tyron Woodley’s title at some point later this year.